With only a few days to spare to get away, relax and pamper yourself, there's possibly no better way than with a luxury break in a chateau or manor house. The impressive buildings, décor and grounds of some of the properties are truly breathtaking, and the standards of comfort are exceptional. Many of these properties are of historic interest and full of character, with exceptional cuisine and fantastic wines giving you a true flavour of traditional France. Situated just over the channel, they are easily accessible for a short break. Whether you're looking to celebrate a special occasion, wanting a relaxing weekend away in superb surroundings or you want to buy some bubbly at low prices, a short break in the Champagne region will satisfy. The rolling vineyards, lush green fields and historic towns provide the perfect backdrop for a romantic break; and a glass or two of the world-famous bubbly will also help mark the occasion. The famous town of Reims or the less discovered Troyes are favourites; however the towns of Chalon, Epernay and L'Epine are also worth a visit. The region of Normandy offers magnificent scenery and historic towns, both on the coast and inland, including the impressive city of Rouen and the wonderfully preserved port of Honfleur. Calvados, Camembert and Cider are three of the famous culinary products of Normandy. The natural landscape also draws visitors with its contrasting rugged white cliffs, sandy beaches and beautiful lush valleys. Other highlights include the Bayeux Tapestry, almost 1000 years old, the beaches of the D-Day landings of World War 2, the stunning medieval abbey at Mont-St-Michel, Le Mémorial de Caen, andThe Musée de Beaux-Arts André Malraux in Le Havre. Between them these two regions of France offer a myriad of towns and places of interest and therefore a variety of reasons to visit time and time again. The main port of Calais offers a gateway via ferry or Eurotunnel from which it is easy to travel onwards. Along the coast you'll discover the fishing port of Boulogne and the glamorous resort of Le Touquet. 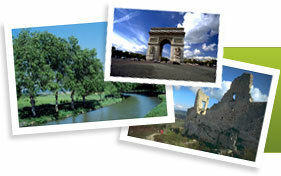 Heading inland you'll discover the Battlefields towns of Arras and Abbeville. The delightful towns of St Omer, Béthune and Cambrai are all within easy reach from Calais.